Following his trip to Royal Randwick on Boxing Day "Todd" will travel to Kembla Grange on Saturday 14th January to contest a 1500m B/M60 race. 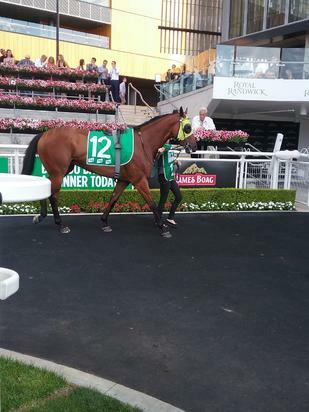 The experience he gained at Randwick (noise, crowds, Theatre of the Horse and tunnel onto the track) was crucial to his learning as we hope to be back there at Easter for the Provincial Championships. Although he failed to run a place his performance wasn't at all disappointing as he was able to keep in touch with the higher graded horses against him. His owners and friends certainly had a great day at the famous course, partaking of the privileges on offer to owners and we all look forward to another visit!